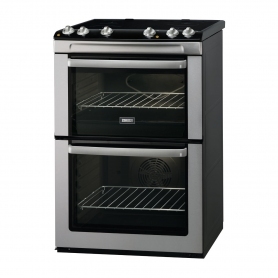 Start a cooking revolution in your home with the Zanussi ZCV668MX electric double oven cooker. Whether it’s gourmet gastronomy or comfort food, take your cooking to a whole new level. Double ovens offer you loads of space to cook your food but, more than that, they offer you more flexibility. With two ovens on the go, you can cook different dishes simultaneously. The top oven features a variable grill, letting you make crispy bacon and golden waffles to finish off your breakfast feast. It works as a conventional oven too, perfect for when you’re cooking multiple dishes at once. With plenty of room in the 72-litre bottom oven, you won’t have any problem fitting in the chicken for your Sunday roast. Featuring a ThermaFlow® cooking fan, you’re able to cook more quickly and at lower temperatures, helping you save time and money. The clever placement of the fan also ensures that flavours aren’t transferred from one dish to another. Both ovens have lights inside, which makes it easier to keep an eye on everything without having to open any doors. You can also choose from 5 shelf positions and three cooking levels, giving you the flexibility to cook for any occasion. Ceramic hobs are visually pleasing and can be much easier to keep clean than other models. Without having to avoid pan supports, the smooth, flat surface of this hob lets you wipe it down quickly and easily. Four cooking zones are provided on the hob of the ZCV668MX, in two different sizes. This lets you have all your pots and pans on the go at once, with plenty of space for everything, while the hot hob indicator will let you know if the surface is still hot. The ZCV668MX comes with a grill-pan, and an assortment of shelves for the oven, so you can get cooking straight away. Enamel linings inside the oven are much easier to wipe down, allowing you to keep your new appliance spotless. The stainless steel finish on this Zanussi cooker, coupled with the sleek design of the ceramic hob, means it look modern and sophisticated – a real centre-piece for your kitchen. The soft design control panel will also make for easy cleaning and a clearer temperature control. Both oven doors feature double glazing. Not only does this allow you to see inside without opening the doors, but also allows for better insulation. Heat is kept inside the appliance, improving energy efficiency and keeping the door surface cooler to touch. 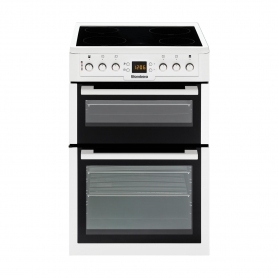 If you’re looking to enhance your home cooking, take a look at the Zanussi ZCV668MX today.